Bridging the Gaps between Design and Use: Developing Tools to Support Environmental Management and Policy. Summary 3.1 A gap between design and use? 3.2 Decision and information support tool review 3.3 Supporting organisational decision making 3.4 Supporting participatory and collaborative decision making 3.5 The nature and extent of the gap 3.6 Good practice guidelines for involving users in development 3.6.1 Know the capabilities and limitations of DIST technologies 3.6.2 Focus on process not product 3.6.3 Understand roles, responsibilities and requirements 3.6.4 Work collaboratively 3.6.5 Build and maintain trust and credibility 3.7 Conclusions References. 4.4.1 Prediction: model use in the development of the US clean air mercury rule 4.4.2 Exploratory analysis: microeconomic modelling of land use change in a coastal zone area 4.4.3 Communication: modelling water quality at different scales and different levels of complexity 4.4.4 Learning: modelling for strategic river planning in the Maas, the Netherlands 4.5 Conclusions 4.5.1 Models for prediction purposes 4.5.2 Models for exploratory purposes 4.5.3 Models for communication purposes 4.5.4 Models for learning purposes References. Uncertainty in Environmental Decision Making: Issues, Challenges and Future Directions. Summary. 5.1 Introduction 5.2 Environmental Decision-Making Process 5.3 Sources of Uncertainty 5.4 Progress, Challenges and Future Directions 5.4.1 Risk-based assessment criteria 5.4.2 Uncertainty in human input 5.4.3 Computational efficiency 5.4.4 Integrated software frameworks for decision making under uncertainty 5.5 Conclusions References. Environmental Policy Aid under Uncertainty. Summary. 6.1 Introduction 6.2 Factors influencing perceptions of uncertainty 6.3 Uncertainty in decision models 6.4 Uncertainty in practical policy making 6.5 Reducing uncertainty through innovative policy interventions 6.6 Discussion and conclusions References. Integrated Modelling Frameworks for Environmental Assessment and Decision Support. Summary. 7.1 Introduction 7.1.1 A first definition 7.1.2 Why do we develop new frameworks? 7.1.3 A more insightful definition 7.2 A generic architecture for EIMFs 7.2.1 A vision 7.3 Knowledge representation and management 7.3.1 Challenges for knowledge-based environmental modelling 7.4 Model Engineering 7.4.1 Component-based modelling 7.4.2 Distributed modelling 7.5 Driving and supporting the modelling process 7.5.1 The experimental frame 7.6 Conclusions References. Intelligent Environmental Decision Support Systems. Summary. 8.1 Introduction 8.1.1 Complexity of environmental systems 8.1.2 New tools for a new paradigm 8.2 Intelligent environmental decision support systems 8.2.1 IEDSS development 8.3 About uncertainty management 8.4 Temporal reasoning 8.4.1 Featuring the problem 8.4.2 Approaches to temporal reasoning 8.4.3 Case-based reasoning for temporal reasoning 8.5 Geographic information and spatial reasoning 8.5.1 Understanding spatial reasoning 8.5.2 Kriging and variants 8.5.3 Representing change/time steps/feedback loops 8.5.4 Middleware, blackboards and communication protocols 8.5.5 Multiagent systems 8.6 Evaluation of IEDSS and benchmarking 8.6.1 Benchmarking 8.7 Conclusions and future trends References. Formal Scenario Development for Environmental Impact Assessment Studies. Summary. 9.1 Introduction 9.2 Terminology and background 9.2.1 Terminology 9.2.2 Characteristics of scenarios 9.3 A formal approach to scenario development 9.3.1 Scenario definition 9.3.2 Scenario construction 9.3.3 Scenario analysis 9.3.4 Scenario assessment 9.3.5 Risk management 9.4 Monitoring and post-audits 9.5 Discussions and future directions 9.5.1 Uncertainty issues 9.5.2 Potential obstacles to formal scenario development 9.5.3 Future recommendations References. Free and Open Source Geospatial Tools for Environmental Modelling and Management. Summary. 10.1 Introduction 10.2 Platform 10.3 Software stack 10.3.1 Geospatial software stacks 10.3.2 System software 10.3.3 Geospatial data processing libraries 10.3.4 Data serving 10.3.5 User Interface 10.3.6 End-user applications 10.4 Workflows for environmental modelling and management 10.4.1 Case 1 – Cartographic map production 10.4.2 Case 2 – Web-based mapping 10.4.3 Case 3 – Numerical Simulation 10.4.4 Case 4 – Environmental management 10.5 Discussion 10.6 Conclusion References. Modelling and Monitoring Environmental Outcomes in Adaptive Management. Summary. 11.1 Adaptive management and feedback control 11.2 Shared and distinct features of the management and control problems 11.3 Adaptivity 11.3.1 Limitations of feedback and motivation for adaptivity 11.3.2 Adaptive control and its failings 11.4 Problems in adaptive management and some tools from other fields 11.4.1 A short list of problems in adaptive management 11.4.2 “Difficulties in developing acceptable predictive models” 11.4.3 Robustness to poor prediction via model predictive control 11.4.4 Adaptive management and Bayesian analysis 11.4.5 “Conflicts regarding ecological values and management goals” 11.4.6 “Inadequate attention to nonscientific information” 11.4.7 “Unwillingness by agencies to implement long-term policies” 11.5 Open challenges for adaptive management 11.5.1 Characterisation of uncertainty 11.5.2 Matching the model to system characteristics 11.5.3 Bottom-up and top-down modelling 11.6 Conclusions preceding the workshop Appendix: Summary of workshop discussion References. 12 Data Mining for Environmental Systems Summary. 12.1 Introduction 12.2 Data mining techniques 12.2.1 Preprocessing: data cleaning, outlier detection, missing value treatment, transformation and creation of variables 12.2.2 Data reduction and projection 12.2.3 Visualisation 12.2.4 Clustering and density estimation 12.2.5 Classification and regression methods 12.2.6 Association analysis 12.2.7 Artificial Neural Networks 12.2.8 Other techniques 12.2.9 Spatial and temporal aspects of environmental data mining 12.3 Guidelines for good data mining practice 12.3.1 Integrated approaches 12.4 Software - existing and under development 12.5 Conclusions and challenges for data mining of environmental systems References. Generic Simulation Models for Facilitating Stakeholder Involvement in Water Resources Planning and Management: a Comparison, Evaluation, and Identification of Future Needs Summary. 13.1 Introduction 13.2 Model characteristics and comparisons 13.3 Stakeholder Involvement 13.4 Enhancing non-expert modelling accessibility 13.5 Reaching out to younger generations 13.6 The current state of the art - results of workshop discussion 13.6.1 On detail and complexity 13.6.2 On stakeholder participation and shared vision modelling 13.6.3 On applied technology 13.6.4 On development and continuity 13.6.5 On content 13.7 Overall conclusion References. Computational Air Quality Modelling. Summary. 14.1 Introduction 14.2 The purpose of air quality modelling 14.3 Urban air quality information and forecasting systems 14.4 Integrated modelling 14.5 Air quality modelling for environment and health risk assessments 14.6 Air quality modelling as a natural part of climate change modelling 14.7 Scales of the processes/models and scale-interaction aspects 14.8 Chemical schemes and aerosol treatment 14.9 Real-time air quality modelling 14.10 Internet and information technologies for air quality modelling 14.11 Application category examples References. State of the Art in Methods and Software for the Identification, Resolution and Apportionment of Contamination Sources. Summary. 15.1 Introduction 15.2 Data sets 15.3 Models and Methods 15.3.1 Principal Component Analysis and Factor Analysis 15.3.2 Alternatives to PCA based methods 15.3.3 Other Related Techniques 15.4 Some Applications 15.4.1 Combined Aerosol Trajectory Tools 15.4.2 Source identification in southern California by nonparametric regression 15.4.3 Comparison between PMF and PCA-MLRA performance 15.5 Conclusions References. Regional Models of Intermediate Complexity (Remics) – A New Direction in Integrated Landscape Modelling. Summary. 16.1 Why do we need better models on a landscape scale? 16.2 The way forward 16.3 Landscape models 16.3.1 Selection of landscape indicators 16.3.2 REMICs 16.3.3 Hybrid models 16.3.4 Complexity in landscape modelling 16.4 A sample modelling tool 16.5 Conclusions References. Challenges in Earth System Modelling: Approaches and Applications. Summary. 17.1 Introduction 17.2 Key challenges (1) 17.2.1 Atmosphere modelling 17.2.2 Land modelling 17.2.3 Ocean modelling 17.3 Key challenges (2) 17.3.1 Overall discussion 17.3.2 Biogeochemical modelling needs 17.3.3 Methodologies for employing output from earth system models 17.4 Conclusions References. Uncertainty and Sensitivity Issues in Process-Based Models of Carbon and Nitrogen Cycles in Terrestrial Ecosystems. Summary. 18.1 Introduction 18.2 Uncertainty 18.2.1 Uncertainty in measurements 18.2.2 Model uncertainty 18.2.3 Scenario uncertainty and scaling 18.3 Model validation 18.4 Sensitivity analysis 18.5 Conclusions References. Model-Data Fusion in the Studies of Terrestrial Carbon Sink. Summary. 19.1 Introduction 19.2 The major obstacles 19.3 The solutions 19.3.1 The use of FLUXNET data 19.3.2 The use of atmospheric CO2 concentration measurements 19.3.3 The use of remote sensing data 19.4 The way forward References. The complex and multidisciplinary nature of environmental problems requires that they are dealt with in an integrated manner. Modeling and software have become key instruments used to promote sustainability and improve environmental decision processes, especially through systematic integration of various knowledge and data and their ability to foster learning and help make predictions. 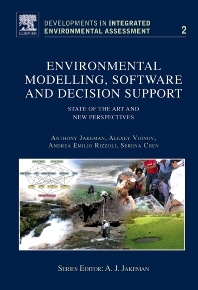 This book presents the current state-of-the-art in environmental modeling and software and identifies the future challenges in the field.